Home / Spirituality / How Would You Answer Someone Accusing Christianity Of Exclusivism? 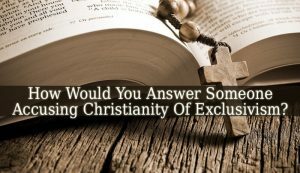 How Would You Answer Someone Accusing Christianity Of Exclusivism? – This is a hard question for most Christians. The truth is that Christianity is the most criticized religion on this planet. Christians are accused to be narrow-minded and exclusivists. Therefore, many Christians don’t know how to argue someone who accuse them. But there are ways to win such an argument. The first step is to recognize that Christianity is Exclusivist! – yes, it is. In The Bidle, Jesus says that He is the only path to God and His Kingdom. And people can get there only if they follow Jesus and His teachings. This excludes billions of people from Heaven. This is the sad truth. And every Christian have to realize that. Before stubbornly starting to demonstrate that Christianity is not excluding. But this doesn’t mean that you can’t win the argument. The second step is to recognize that every religion is Exclusivist! – Yes, every religion. Buddhists don’t believe in a God, that excludes every other religion that believe in God. Islam says that there is only one God. But that excludes every polytheistic religion. Hindus worship numerous deities. Which is exclusivist for the monotheistic beliefs. Also, Islam says that Jesus was just a prophet. This is exclusivist towards not only Christians, but also atheists. Who believe that Jesus didn’t even exist. But, you might argue with an agnostic. Agnostics are “open-minded”. But saying that they are not sure about the existence of God, but they don’t deny it is exclusive toward atheists. Who “know” that God doesn’t exist. Therefore, anyway you put it, every religion on the planet is exclusivist toward one or religious followers. Do you want to know also Why Did The Caliphs Demonstrate Religious Tolerance To Jews And Christians? or Upon The Roman Emperor’s Acceptance Of Christianity, How Did The Religion’s Status Change? The third step is to recognize that the accuser is Exclusivist! – you can’t say that there is another way to Heaven beside Jesus, because it is exclusivist toward every Christian. If the accuser is intelligent enough to understand these 3 steps and their essence. Then he will realize that his accusations were pointless. In conclusion, Answering the question How Would You Answer Someone Accusing Christianity Of Exclusivism? Is not easy. If your accuser is a narrow-minded himself, than these three steps will not work. There are moments when you just have to leave the table. And focus on your own Spiritual Growth. You can’t win every argument. But if the accuser seems rational, these arguments will show him that Christianity is not the only exclisivist religion on the planet. Every time a person makes an argument saying something “true” for himself, he excludes a whole class of people who believe the opposite. Next Upon The Roman Emperor’s Acceptance Of Christianity, How Did The Religion’s Status Change?